The holidays are so busy, yet most of us are looking for something a little more elegant to serve. This recipe couldn’t be simpler, and it’s as good for a weeknight dinner as it is for your Christmas feast. 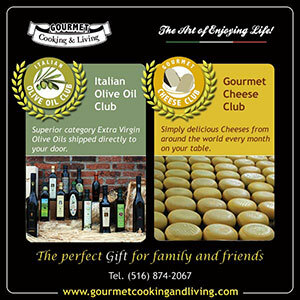 Make extra glaze – you can use it on many meats, fish, or vegetables, and it makes a great dip for chunks of Parmigiano Reggiano cheese when you are in a pinch for a quick appetizer for guests stopping by. Combine vinegar, brown sugar, and soy sauce in a small saucepan and bring to a boil. Reduce heat to low and simmer until thick and syrupy, about 20 minutes. Remove from heat and let cool. While glaze is cooking, remove tough ends from asparagus, then toss with olive oil and sprinkle with salt. 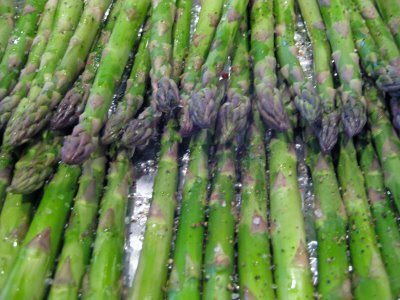 Lay flat on a foil lined baking sheet and roast at 400 degrees until asparagus is cooked, 10-20 minutes depending on how soft you like it. To serve, drizzle a small amount of balsamic glaze over the spears and pass extra at the table. 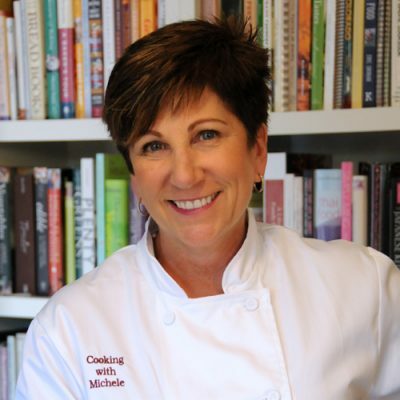 Hi Michele…I ended up here from Lea Ann’s blog where you left a link to this dish. You can’t imagine how prophetic that was. My sister had called and asked for what I would suggest she include for their Easter meal and I suggested she grill some asparagus as she did not mention a vegetable. I was in the middle of reading Lea Ann’s post when her call came in and…I’m not kidding, happened on your link at about the same time as she said, ‘We can’t use the grill, it’s snowing and there will probably be a good foot of snow on it Easter Sunday. Situation resolved…your link is on it’s way to her in Wisconsin; thanks! 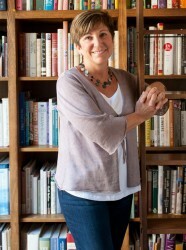 Hi Michele, I too came over from Lea Ann’s blog to check out your balsamic glaze. Like Lea Ann, I fell in love with it when it was served in a restaurant and immediately went out and bought my own bottle. Several times it occured to me I ought to try and make my own, but somehow never got around to it. Thank you for de-mystifying balsamic glaze. I will definitely give it a try and my wallet will be soooo pleased I don’t have to use the expensive brand. Your asparagus dish sounds wonderful. We love asparagus in our kitchen and are always on the lookout for more recipes to make it interesting. 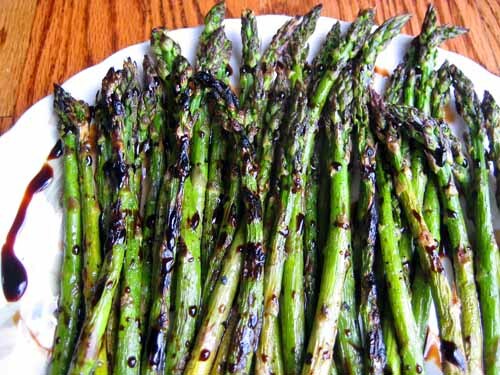 My first use of my own balsamic glaze will definitely be on grilled asparagus as you’ve suggested. Saw this at Lea Ann’s blog and had to get the instructions for this glaze – it sounds wonderful! This recipe is terrible. This was supposed to take 20 mins., but instead we simmered and simmered and simmered until I felt like I had to add more sugar. Finally after an hour and the smell in the house went from balsamic vinegar to just burnt vinegar. If you like being frustrated, then this recipe is definitely for you. Negative 5 stars for the simple fact that we couldn’t even taste it because it never thickened. Jeff, I’m sorry that you had a bad time making the glaze. I’ve made it many, many times, just as the recipe shows, and it’s been successful. I’m not sure if you let it cool, but any glaze thickens only after it cools. So you may have been looking at the hot liquid and thinking it wasn’t thick when in fact it would be quite thick when cooled. As for the vinegar smell, that comes with the territory when making a vinegar based glaze, gastrique, or other sauce. if you’d like to call me to talk through the recipe so you can try it again I’m happy to chat with you. I’ve made this recipe many times before reading this (minus the soy sauce) and can only add this tidbit for those trying it out. I’d probably suggest those trying it out to “try” with a smaller batch before you commit to a bigger project like dinner for 4. You might find a better success with a smaller project… and just keep watching it and like Michele said, it does thicken up quite a bit (so don’t keep cooking it until it’s tar. lol). I tend to take a teaspoon and instead of tasting it right away (cause it’s hot), to see if it is sticking to the spoon. Good luck! It is yummy. local fish house tis evening. 2 questions, 1 how long does it keep in the frig. What about adding butter as some have suggested and would that effect the frig life. Bill, if you make the glaze the way I do it has an almost forever life in the fridge -just like soy sauce and vinegar don’t go bad. But if you start adding things like butter (which I don’t think it needs at all) you would shorten it’s life. enjoy! I just whipped this up tonight, and it was a complete success. I was surprised that the glaze did not overpower the asparagus at all. Hello, this looks excellent. I recently attempted a different balsamic glaze (similar, but no soy sauce) that didn’t thicken the way it was supposed to. I think I might have just not cooked it long enough though I’m not sure. I still have quite a bit of the liquidy consistency stuff in the fridge. Any idea if I put back in a pot, added some soy sauce and cooked it for a while it would work or should I start over from scratch? Thanks, this looks great. If I can figure out the glaze it’s going to be my Thanksgiving contribution. Alise, you don’t need to add the soy sauce – it just adds a tiny bit of flavor complexity, but you can make the glaze without it. Not all balsamic vinegars are the same – older ones are already thicker, younger ones can be quite thin. I would just put it back in the pot and continue to reduce it by simmering it slowly. When it coats the back of a spoon without running right off, it’s ready! Found and tried this glaze, put it on string beans! Everyone loved it, seen it in upscale restaurants. Usually with some bland entree like fish or pork chops. You can buy the really cheap vinegar. I’m going to make this glaze tonight and serve over sautéed asparagus, green beans and carrots. I’ve tried other balsamic glazes and liked them but yours has soy sauce and olive oil. This was delicious!! I’m not a great cook at all so I was concerned when I saw Jeff’s comments. I changed my burner to a larger burner so that it cooks more slowly on low. It worked!! It is amazing on the asparagus! !